This past Sunday was Montreal’s St. Patrick’s day parade. Unfortunately for us, it was an inhospitable -8 C / 18 F. I heard someone say the wind chill rating was -17 /1. Not a great day for a parade. But, somehow, St. Pat brings out the Fighting Irish in all of Montreal. Thousands of parade watchers were somehow willing to gather, muffled to the eyes in many cases, to tough out the cold in the pre-parade street party. I was surprised how early the crowds gathered, and what a great time everyone seemed to be having. The parade marchers were even more heroic – the girls in Irish dancing costumes had to face the weather in skirts and tights. The marching bands had to be in uniform, no scarves for them. I imagine the people in giant padded mascot suits were the only ones warm enough that day. These sketches are a testimony to the power of Urban Sketchers as a drawing club - as in, the great value it has for your own motivation. If I had not set a time to meet the other sketchers on the street I’d probably have given up. But I had made plans to get these drawings, so freezing wind be damned, I was going to draw. It’s also evidence of another theory of mine – that the hardships of drawing on location actually make the drawings better. It was necessary to work at great speed. Not just because the marchers were moving at a clip, or that your portrait subjects were constantly vanishing in the crowd – but because as soon as you open your pen, a countdown begins. In moments, the ink begins to stiffen up, and your fingers begin to hurt. Soon the pains are sharp enough you can’t ignore. You have to tough it out to the end of the drawing, and then get your hands back into your coat. Great motivation to make the fastest drawing possible! (I was not wearing adequate gloves. I had read online to try latex gloves as liners for knitted mitts. Don't try this. It does not work in the slightest). But either way, difficult conditions really help you make decisive drawings! You’ll find yourself making the swiftest observations. It’s amazing how it changes your work – towards the more aggressive, more spontaneous line. Just look at this sketch of the fellow wrapped in the Irish flag – I think it’s one of my best drawings ever. You can’t make this kind of drawing at leisure. At home, in the studio, you just aren’t stressed enough to kick into ‘survival sketching mode’. For people taking my Sketching People in Motion online class - these are done directly with the pen. No time for the pencil scribbles underneath that I demo in class. Not to say what I teach in the video is invalid, just that the Pencil > Pen > Brush method is a good way to learn, and when you're ready, you can go 'all in'. The color, by the way, was done afterwards in the cafe. You can't watercolor in a sketchbook in the cold. The paint simply won't dry, and you can't turn the page to carry on. You might notice a bit of extra excitement in the line work – even beyond what came from the harsh drawing situation. This was my first test run with a Noodler's Creaper. Their so-called ‘Flex Nib’. I have to say it’s not as flexible as a dip nib – but it’s closer than I’ve had in a conventional Lamy or Platinum pen. I have one minor complaint about The Creaper – the built-in ink filling system. It’s an old fashioned design where you stick the whole pen nose down into the ink bottle and twist the back end to vacuum up ink. It’s mechanically sound – fills just fine – but there is a flaw. 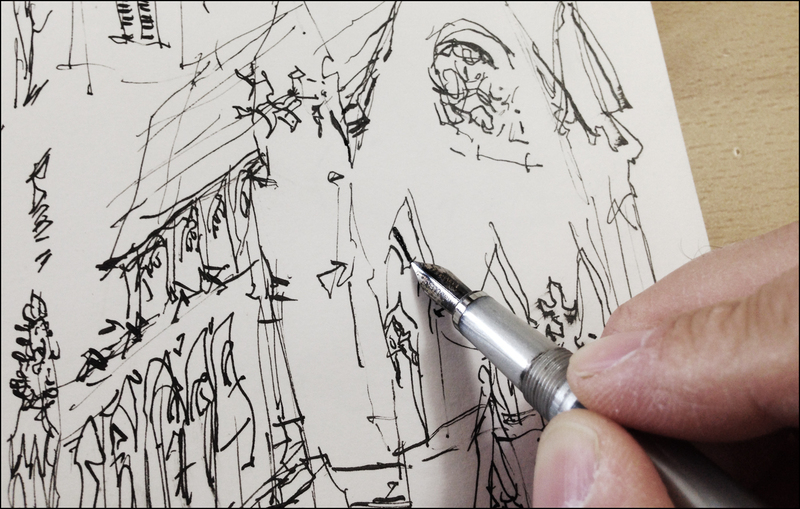 If you stick the cap on the back of the pen while drawing – trying to fidget it off later causes you to turn the filling mechanism and squirt ink out of the pen. I was lucky to avoid ruining a drawing. The other downside is, you can’t fill this pen if the ink level is your bottle is lower than the full length of the nib and feed. Whereas a cartridge-style ink filling gadget can get suction on the ink, even with only a few mils left in the bottle. Minor complaints – but there you go. So far, the drawing feel of this pen is quite good, so I’m going to keep it for a while and report more as I go.